The dating of post cards is highly problematical, invariably the card was produced somewhat later that the actual photograph was taken. 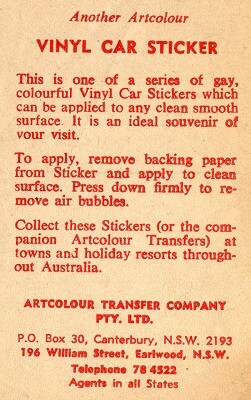 Thereafter, the postcards were produced for many years after their original release. Some of the following examples are dated based on the approximate time when the image was first taken. 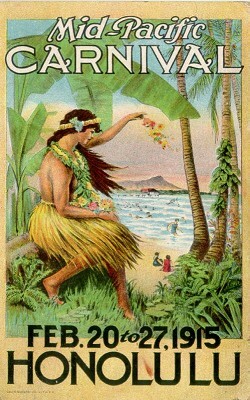 Postcard Honolulu to England, September 1902. Native with Surf Board, Waikiki Beach, circa 1898, by Frank Davey. This is a picture of a native man going bathing. The board he carries out into the water & ... ... on a big wave comes in ... and rides up to the shore again. Yours lovingly, Uncle Tom ? 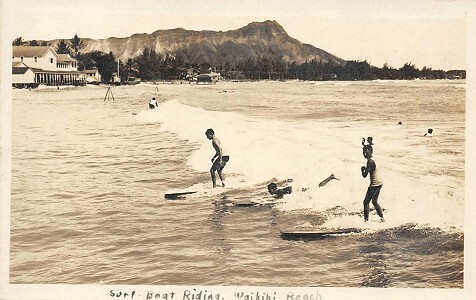 Surf Riders at Waikiki, circa 1905. 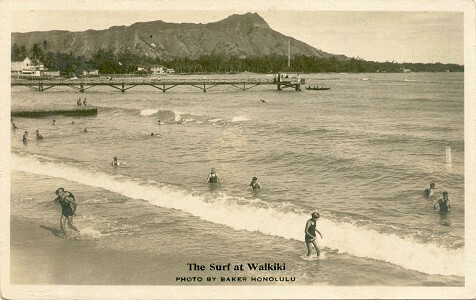 The Surf at Waikiki, circa 1905. Shooting the Breakers, Manly, circa 1905. 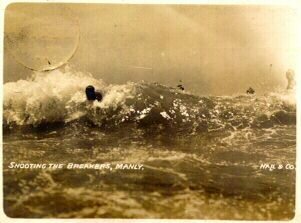 Body surfing at Manly Beach, circa 1905. 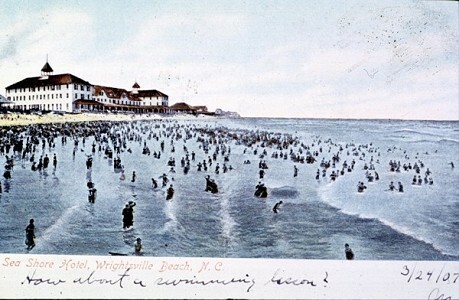 Sea Shore Hotel, Wrightsville Beach, N.C.
in the bottom right of this postcard in 2010. SlapDash Publishing, Carolina Beach, 2008. 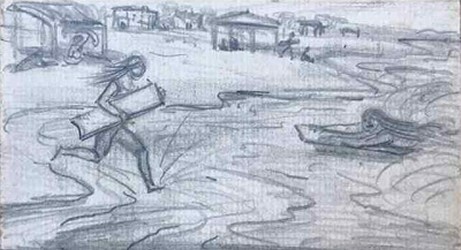 Illustration: Surf Riders, Forte dei Marmi, 1906. 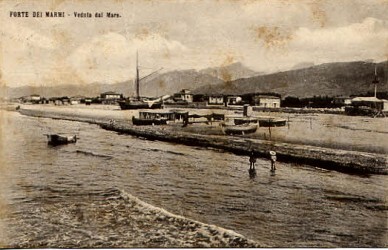 Postcard: Forte dei Marmi Beach-front, c1910. 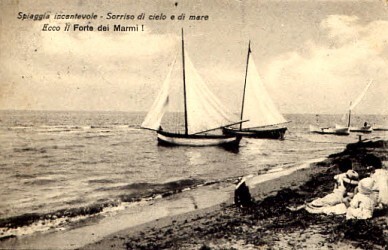 Postcard: Small Sailboats, Forte dei Marmi, c1910. 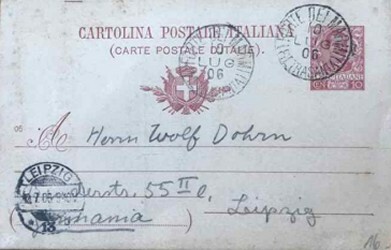 Forte dei Marmi,Tuscany, to Leipzig, Germany,1906. Photograph: Guests, Byron Hotel, Forte dei Marmi, c1930. 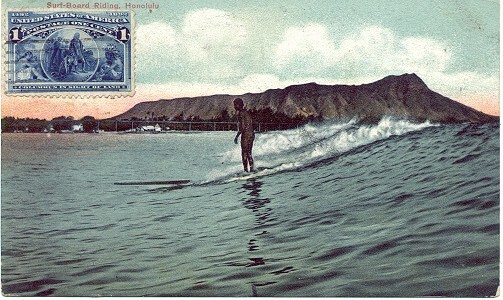 Prone Surfboard Riding, Italy, hand-drawn postcard, July 10, 1906. Hand drawn postcard/lettercard, posted from Forte dei Marmi, Tuscany, Italy, in July 1906 to to Leipzig, Germany. I was alerted to the re-posting by Bob Green, who contacted Olaf de Vries from Holland and Arthur Pauli from Germany to attempt a translation after the difficult task of deciphering the hand-written text. Rod Rogers also suggested the text could be in Old German and that the addressee was a gentleman doing university studies in Germany and that the writer was probably female (need to check my notes but I think something to do with language word tense), and also written in somewhat formal, respectful form. 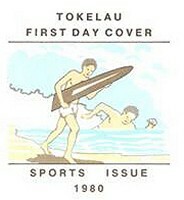 In the foreground of the illustration one bather is shown riding prone on a small surfboard in the shore-break while another runs into the surf holding a similar board, with a convex tail. It appears that both board-riders are female, which would be consistent with Rod Rodger's suggestion that the writer-illustrator is also female and the greetings also from Frau Sattler, presumably a travelling companion, or chaperone. Another surfer holding a board and approaching the water can be seen further down the beach, along with several sunbathers under temporary shelters along the shoreline, fronting more substantial buildings in the background. 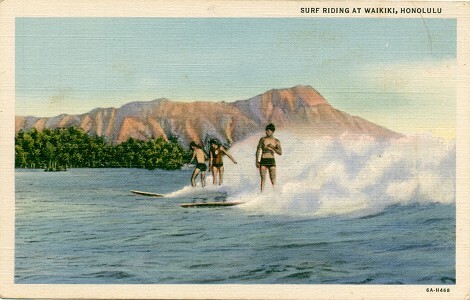 The surfboard-riding appears to be confirmed by the opening sentences, with the implication that some type of board, a Girelate, is used; Olaf de Vries notes that a Girelate is like a shape of a Fish or object that has a shape or outline of a Fish, not a surfboard but an actual fish without a tail. Also, the writer found the activity more difficult than it looked, at first it didn’t work well, and there as an element of danger when startled beneath the wave. It appears probable that the writer was a reasonably confident swimmer, was possibly touring the Mediterranean by ship, and that the recent extreme weather, resulting in the sinking of two small sailing ships, may have produced some local swell. Furthermore, that the boards were most likely available for use or hire by tourists from local hotels or beach concession stands. Forte dei Marmi was a summer tourist resort from the end of the 18th century, favoured by wealthy families from the north of Italy for the sea-air and to sand-bathe, and by 1900 its attractions had became known to other European tourists. 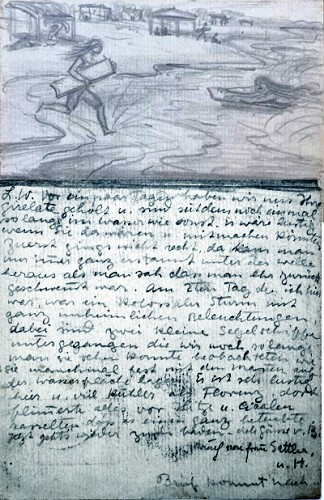 Early postcards of the beach-front have some resemblance to the illustration of 1906; one depicting two small sailing vessels, possibly similar the two little sailing ships sank in an enormous storm as witnessed by the writer. 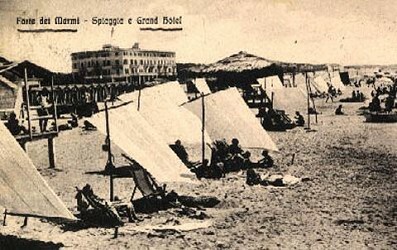 A postcard (below) of the Grand Hotel at Forte dei Marmi shows sunbathers, deckchairs and temporary sun shelters along the shoreline. Postcard: Grand Hotel, Forte dei Marmi, c1910. Importantly, small breaking waves are evident in the background of a photograph of three guests on the beach at Forte dei Marmi in front of the Byron Hotel around 1930, one wearing a two-piece Jantzen swimsuit. 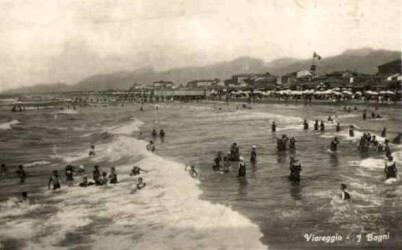 Similar surf conditions, and beach-front amenities, are shown (right) in an early postcard from Viareggio, a few miles south of Forte dei Marmi, a major coastal tourist resort in Tuscany known as the Pearl of the Tyrrhenian Sea. The format is unlike most postcards of the period and it may be a lettercard, a folded card with a prepaid imprinted stamp, first introduced in Belgium in 1882. With twice the space of a postcard, the message is written on the inside then folded and sealed around the edges, and opened by the recipient tearing away the perforated selvages. Girelate geholt u. sind seitdem noch einmal so lange im Wasser wie sonst. Es wäre lustig wenn Sie da wären u. mitmachen könnten. A few days ago we went to get your Girelate and since then are in the water for as long as usually again. It would be funny if you would be here and could take part. At first it didn’t work well, one always came out beneath the wave wondering as one saw that one was rather washed back. Am 2ten Tag den ich hier war, war ein kolossaler Sturm mit ganz unheimlichen Beleuchtungen, dabei sind zwei kleine Segelschiffe untergegangen die wir noch so lange man sie sehen konnte beobachteten wie sie manchmal fast mit dem Masten auf Wasserfläche lagen. On the 2nd day I was here, there was an enormous storm with pretty eerie [or uncanny] illuminations, thereby two little sailing ships sank which we as long as one could see them watched how they sometimes almost laid down on the water with their masts. Es ist sehr lustig hier u. viel kühler als Florenz, dort flimmerte alles vor Hitze u. Cicaden rasselten, dass es einen ganz betäubte. It is very funny here and much cooler than in Florence, everything there glimmered because of the heat and cicadas rattled, which made one pretty numb. Now back to swimming again. Thanks to Charlie Spurr, Rod Rodgers, Bob Green, Olaf de Vries and Arthur Pauli. 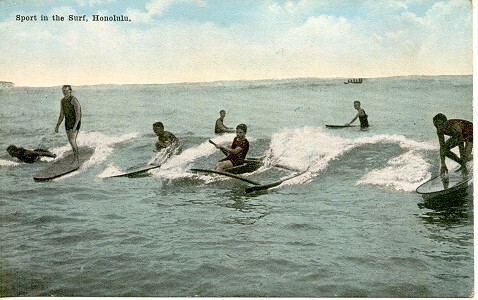 Surfing at Waikiki, Honolulu, circa 1908. 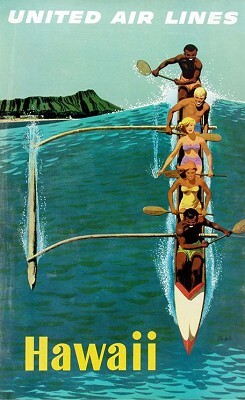 Wall, Nichols & Co. Ltd., Publishers, Honolulu. 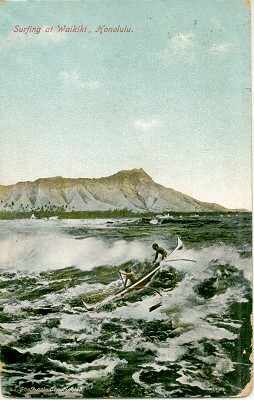 Outrigger canoe surfing at Waikiki Beach, circa 1908. 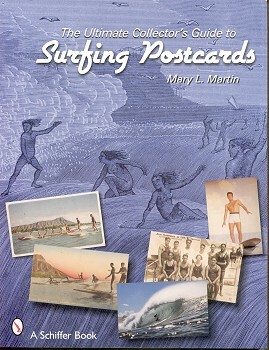 Martin: Postcards (2008), page 100. Variations on pages 11 and 14. Image from the North Carolina State Archives. 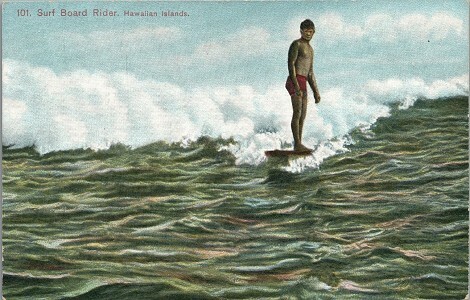 Rider on a long surfboard at Waikiki Beach, circa 1905. Mr. Anatole Kind, St Petersburg, Russia. Come on in - the water's fine, Sincerely, [indeciperable]. 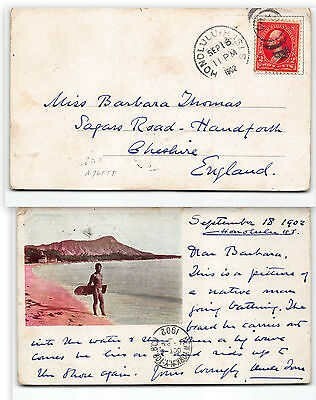 Postmarked Honolulu, 6th April 1910. Front: 1 cent, Blue, Columbus in sight of land. Back: 2 cents, Red, Washington. 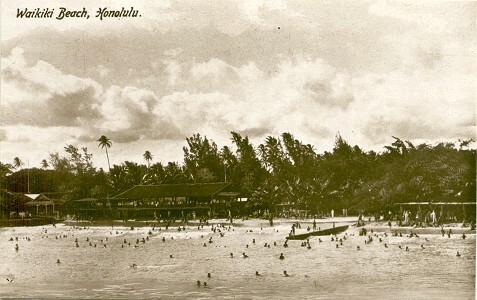 Island Curio Store, Honolulu, 1910. Private Mailing Card, Authorised by Act of Congress May 19, 1898. C. B. & Co. Sydney. 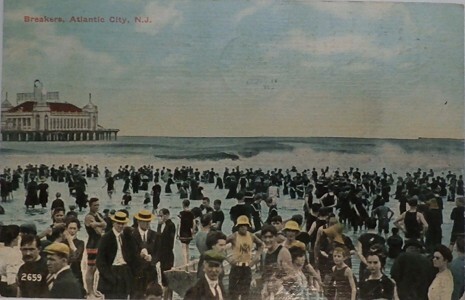 life saving carnival, circa 1908. 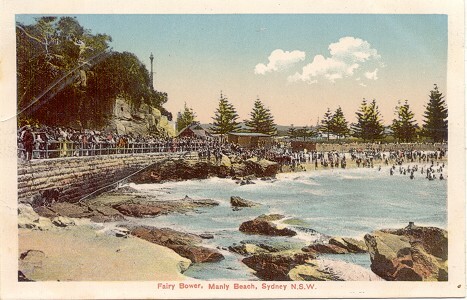 Before the construction of the South Steyne Bathing Pavillion in 1913. 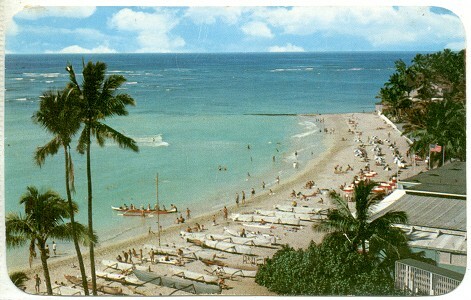 Waikiki Beach, famed in song and story, lies some four miles from the city. while the warm waters of the tropics soothingly on the shore. 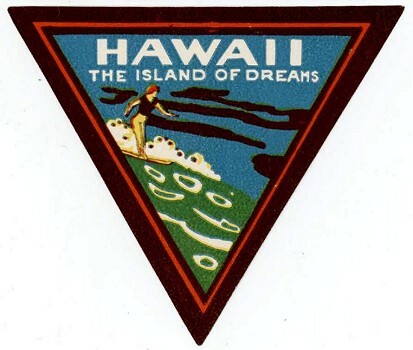 "T. H." : Territory of Hawaii. 101. 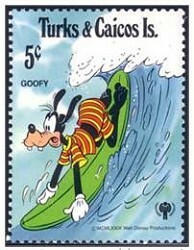 Surf Board Rider. Hawaiian islands, circa 1913. 2. 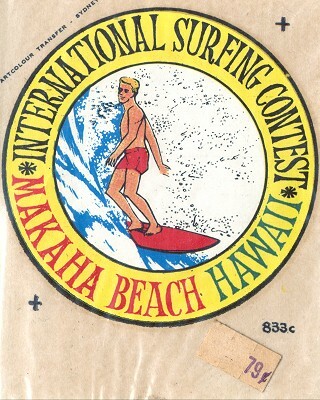 Surf-Board Riders of Hawaii - The Sport of Kings. Oceanic S.S. Co's splendid 10,000 ton twin screw steamers sail every 21 days. 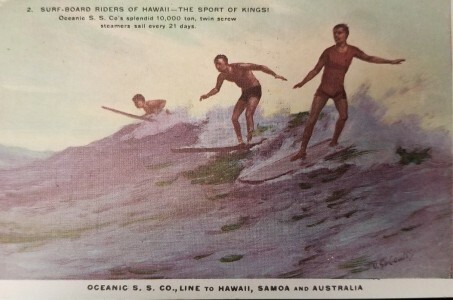 Oceanic S.S. Co., Line to Hawaii, Samoa and Australia. 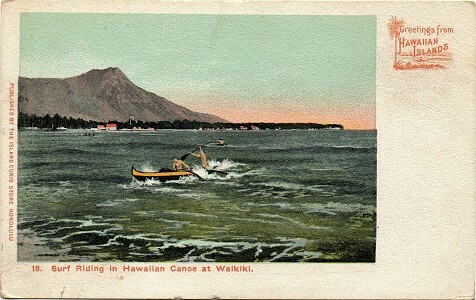 Surf Boat Riding, Waikiki Beach, circa 1920. 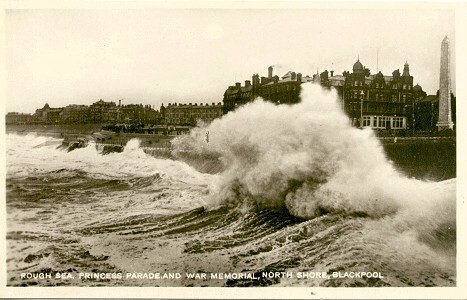 Princess Parade and War Memorial, North Shore, Blackpool, circa 1920. 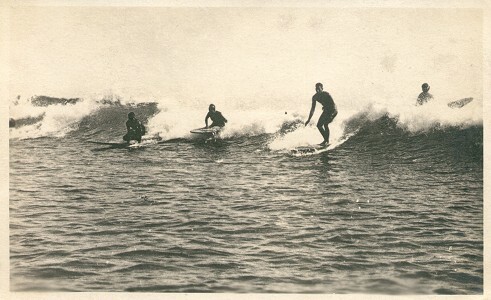 Surfing at Muizenberg, circa 1925. Valentine and Sons Publishing Ltd.
PO Box 1685, Cape Town. Timber prone boards, Muizenberg, South Africa. 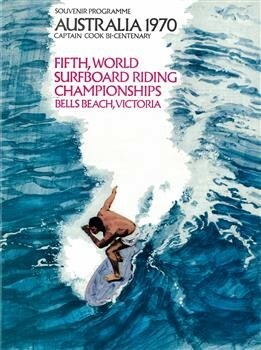 Rod Rogers notes that surf-board riding was so popular that Strict rules implemented by Council in 1911. In the Paciﬁc the islanders have made it an art. At the Cape it has become a cult. The wild exhilaration is infectious. It steadies the nerves, exercises the muscles and makes the enthusiast clear headed and clear eyed. Life and good spirits are qualities of the surf bather. 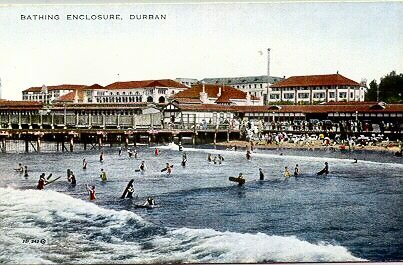 Bathing Enclosure, Durban, circa 1925. P.O. Box 1685 Cape Town. 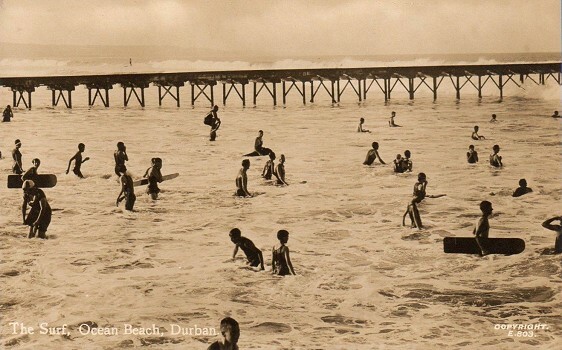 Timber prone boards, Durban, South Africa. "This is where we going surfing on boards during the summer time at our Beach. Note the way the surfboards are put flat on the water & the force of the waves pushes it along until you strike the sandy shore. Love from Vi, 1926." 1920s: 1:28 Beach Hotel, 1:54 Beach Enclosure, 2:11 Surf-bathers, 2:28 End. 1962 colour: 9:58 Skim-boards, 10:03 Sail-boats, 10:18 Malibu riders,10:45 End . 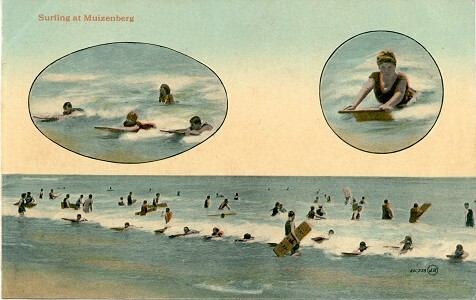 A crowd of bathers, some with prone-boards, wait for a broken wave inside the enclosure pier while a lone surfer, of considerable skill, rides upright on the outside break. 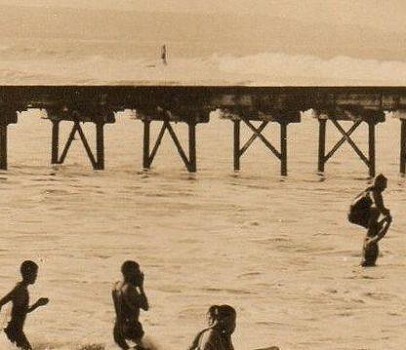 While prone board riding was well established at Muizenberg and Durban following WW1 (see above), this appears to be an very early photograph of stand-up riding. Postcard and detail forwarded by Alex Williams, with thanks, May 2018. 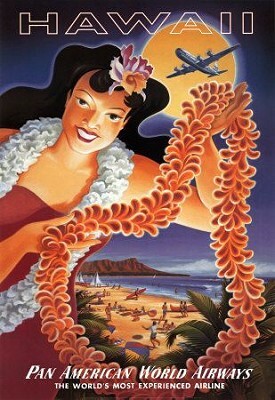 Hawaii - The Island of Dreams, circa 1930. 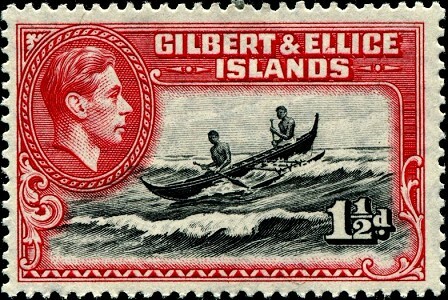 Gilbert and Ellice Islands Postage Stamp [SG 45], 1939-1965. SG 45 was printed by De La Rue and depicts a native canoe crossing a reef. The Gilbert and Ellice Islands, in the Pacific Ocean, were a British protectorate from 1892 and a colony from 1916 to 1976. Since independence the Gilbert Islands have been part of Kiribati, and the Ellice Islands are now known as Tuvalu. This gorgeous set of engraved definitive stamps was first issued in January 1939 and the same designs (with George VI later replaced by Elizabeth II) remained in use until 1965, when they were replaced by much less attractive lithographed designs. The stamps were engraved by very talented anonymous staff engravers. The set was engraved and printed by the three main British Empire/Commonwealth stamp printers: Bradbury Wilkinson, Waterlow, and De La Rue. Engraved Stamp Beauties, viewed 17 may 2014. 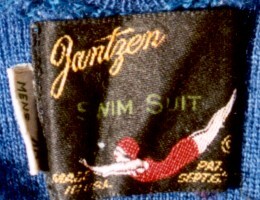 Made only by Curt Teich & Co., Inc., Chicago. The centre rider bears the Outrigger Canoe Club logo. 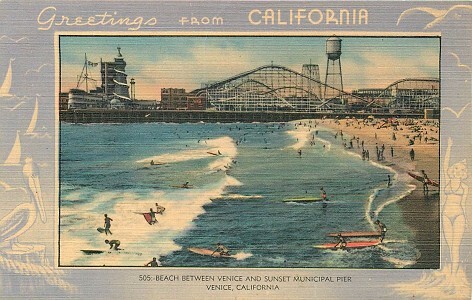 Greetings from California, circa 1940. 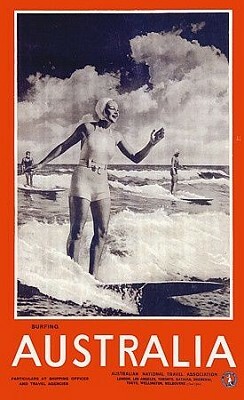 Paddleboards, Venice, California, circa 1940. Wentworth Hotel, Sydney, Australia, circa 1939. 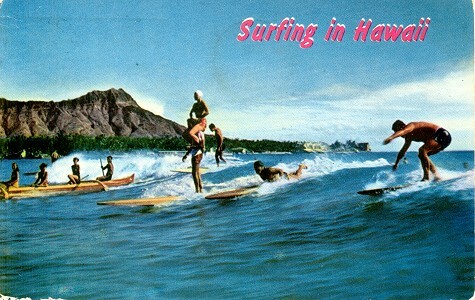 Surfing in Hawaii, circa 1950.
surfing at the beach of Waikiki. Color photography by Stewart Fern. Outrigger canoe, hollow and solid timber surfboards. 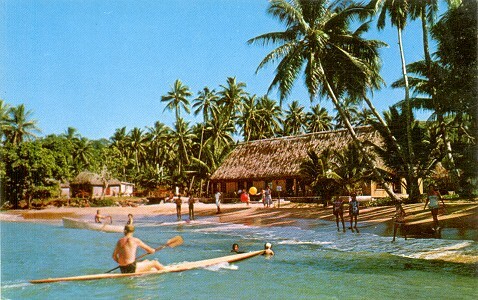 Boating - Korolevu, Fiji, circa 1955. A fascinating pastime at Korolevu Beach Hotel is to take a boat and venture out over the coral reef, where one may either gaze into a wonderland of marine life or indulge in the gentle art of fishing. 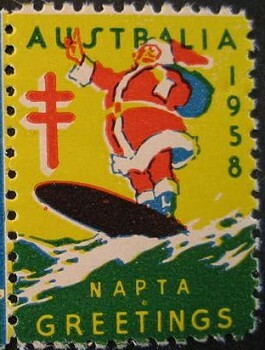 Surfing Santa in Australia, 1958. 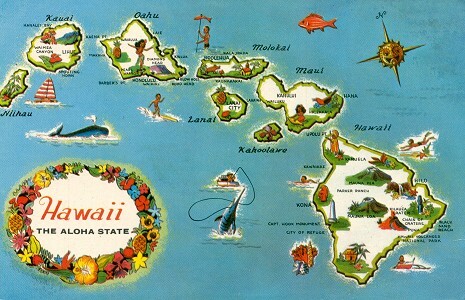 H-9188 - The State of Hawaii. Ponoi-Craft by WW Distributors Ltd., Honolulu-Hawaii. 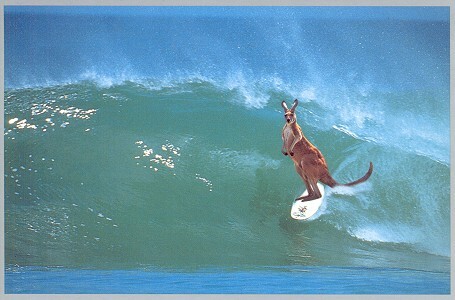 noted for its fine surfing and bathing. Dist. by Max Basker and Sons, Honolulu. Many of the canoes have canvas covers. Surfboard lockers, lower right corner. site at the end of 1963. 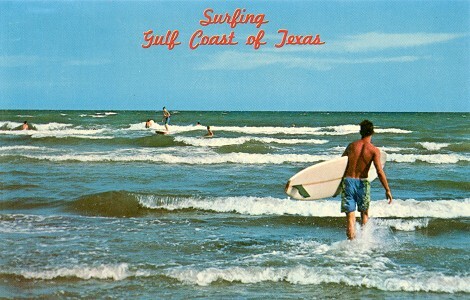 FW-659 - Surfing is an ever increasingly popular sport on the Gulf Coast of Texas. Color by Frank B. Whaley. 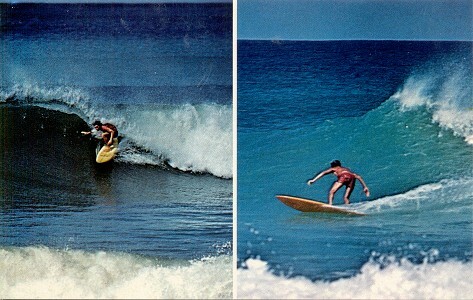 The surfer entering the water carries a board fitted with a Hatchet fin by Dewey Weber, circa 1965. Not postcards, but unable to provide alternative entry point. In plastic bag with original price sticker, 79c. Some of the world's finest surfing spots all within three miles of each other. 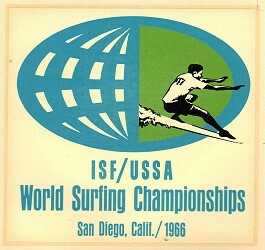 Home of the 1968 World Championship. Photo by Norm and Sue Grosskreutz. 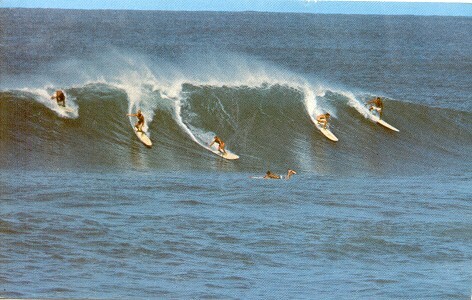 Surfing in French Polynesia, 1971.
beaches in Hawaii by both residents and visitors alike. Nani Li'i Natural Color Card. Turks and Caicos Islands, 1979. Noted by Hervé Manificat in the Surf Blurb, April 2019. 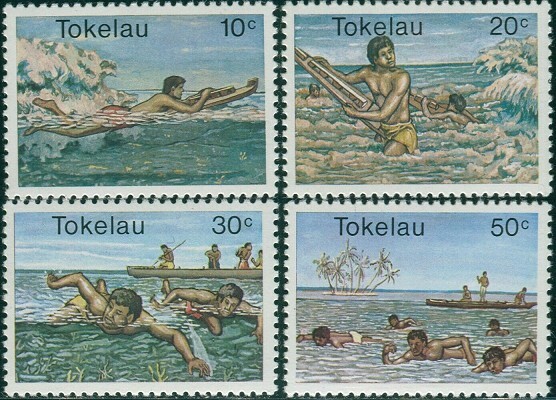 Tokelau is a dependent territory of New Zealand in the southern Pacific Ocean. possibly intended to illustrate a puke, the shaped bow-covering for a canoe. Donald G. Kennedy : Ellice Islands Field Notes,1930. 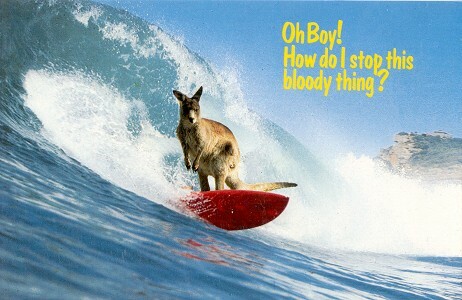 The most popular postcard at the Sydney Olympic Games 2000. ﻿Along with the increase of national incomes our citizens are gradually devoted to outdoor activities recently. 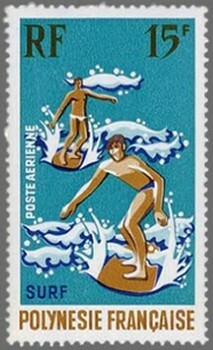 To comply with the government's promotion for building up both physical strength and healthy bodies through leisure activities, this Directorate General of Posts continues to issue a set of four stamps on the topic "Outdoor Activities Postage Stamps. 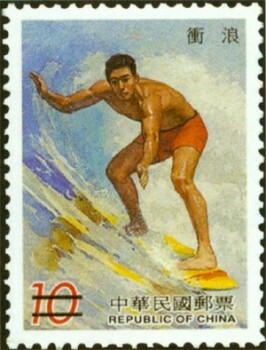 Surfing: Taiwan is surrounded with the sea, which is a good key to developing the surfing. 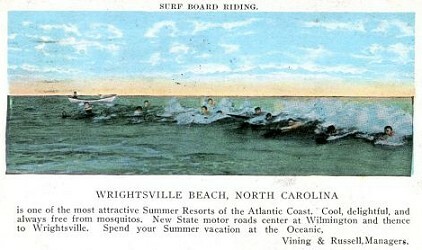 Riding waves between the fearful storms above the roaring sea under the blue sky gives one an enjoyment for the sense of speed and excitement. The catagorisation is haphazard and there is a distinct lack of analysis of the quality or historical significance of the postcards. 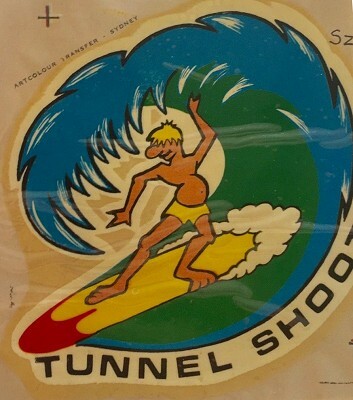 Critically, in the chrome era, there is no distiction between professional surfing photographs and those shot in unattractive surfriding condtions. Geoff Cater (2008-2019) : Postcards.